Toyota Motor Corporation (TMC), Toyota Chemical Engineering Co., Ltd. (Toyota Chemical Engineering), Sumitomo Metal Mining Co., Ltd. (Sumitomo Metal Mining) and Primearth EV Energy Co., Ltd. (PEVE) announce the launch of the world’s first* business to recycle nickel in used hybrid-vehicle nickel-metal-hydride batteries for use in new nickel-metal-hydride batteries. Previously, nickel-metal-hydride batteries recovered by car dealers and vehicle dismantling businesses were subjected to reduction treatment, and scrap containing nickel was recycled as a raw material for stainless-steel manufacturing. Now, with the development of high-precision nickel sorting and extraction technology, materials can be introduced directly into the nickel-refining process, thus achieving “battery-to-battery” recycling. 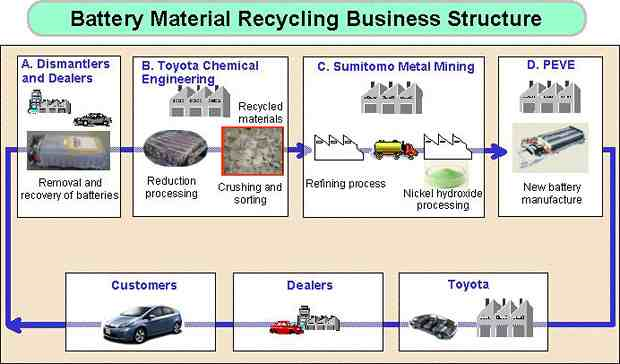 To carry out the business, TMC has established the Toyota HV Call Center to help recover the batteries, constructed advanced recycling facilities designed for mass production in cooperation with Toyota Chemical Engineering, and is receiving support from Sumitomo Metal Mining concerning the refining of nickel for use in batteries. TMC is also receiving support from PEVE concerning quality assurance in the manufacture of hybrid-vehicle nickel-metal-hydride batteries. In addition, making use of trucks on return trips from parts deliveries is planned to reduce environmental impact, including CO2 emissions during transport. 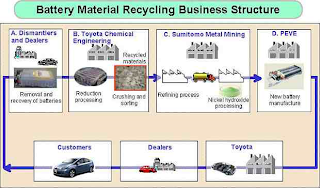 The establishment of this recycling system in Japan will accelerate the creation of a sustainable, recycling-based society, a priority measure for TMC, and is a showcase for recovery and recycling technologies as effective means of promoting and reinforcing recycling in response to global resource limitations. TMC is currently investigating introducing this recycling system overseas.